Overview: Included as part of GoldVisionPro's basic feature set, Intelli-Entry+ allows Administrators to easily define, present and capture custom information for categorizing documents, as well as indexing them for quick and organized retrieval. 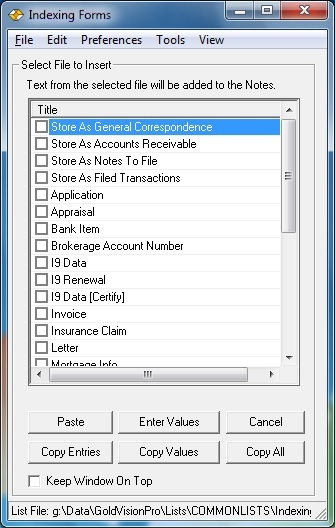 Simple text files enable creating custom windows that open to confirm and/or request related information such as categories, quantitites, dates, individuals, locations, terms, etc., etc. Intelli-Entry+ enables indexing a single item with multiple criteria, providing users with instant non-linear access, and the ability to retrieve files by familiar categories, as well as defined values. An unlimited number of custom items can be incorporated, without any record changes or additional fields. Indexing Forms List: Available during or after the file-storage process, the Indexing Forms window displays a master list of the available Intelli-Enty+ forms, This list can be expanded and contracted to display categories of lists for ease of user selection. As many forms as are needed can be included. In use, multiple items can be selected at one time, allowing for inclusion of common items in a variety of uses. 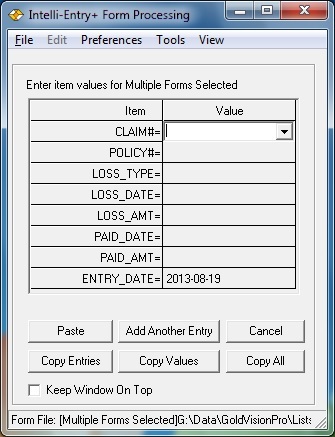 When presented, items are ordered in the sequence they were selected from the Indexing Forms list. As with other customizable features of GoldVisionPro such as Intelli-Note, Intelli-Processing, Intelli-Search, Intelli-Tracking Workflows, the power of Intelli-Entry+ is that it provides a highly customizable and flexible environment, adaptable across a broad variety of business uses. 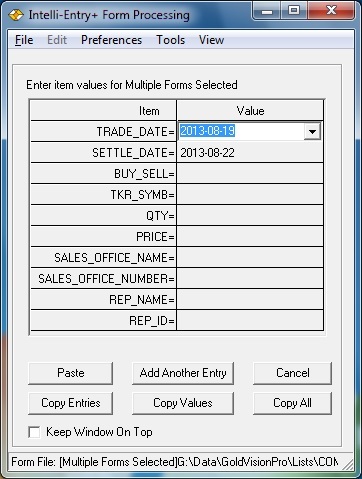 Items can be pre-defined for default values and formats, such as the current date or the file date, or some common base number. Subsequent items can have values based on a previous item's value [dependent items], and include calculations. Drop-down calendars and lists of specific values for user selection, are easily incorporated. GoldMine F2 Lookup lists can be designated as the value lists. Items can be designated as "required" input in order to proceed, or have just a reminder prompt when missing. With the optional V_SRCH capability in the VisionPak-Xtended tool set, lists can dynamically present all the values returned by a custom SQL query. Each item can have a completely different type of value. Each item also can have its own designated auto-format, to re-form user-input to match familiar items such as reference numbers and characters used for Invoices, Sales Orders, Policy and Claim IDs, licenses, registrations, etc., etc. 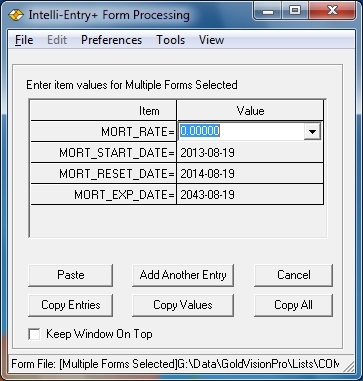 The Intelli-Entry+ custom indexing also integrates with other Intelli-features in GoldVisionPro. When used in conjunction with the Intelli-Group tool, these custom indexing items also enhance the ability to data mine document records for future marketing campaigns. The Intelli-Entry+ information can also be automated to streamline user input, as one of the features of the Intelli-Processing tools. And the Intelli-Note window provides one-click access to all of the Intelli-Entry+ information for use in authoring any document, e-mail or note.